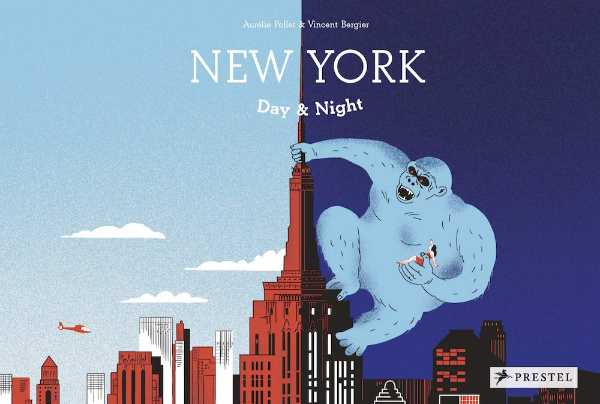 Two adventures through New York City in one book is what readers get from the new picture book New York Day & Night, written by Aurélie Pollet and illustrated by Vincent Bergier. Creatively placed blue translucent pages transform the city’s normal daytime scenes into wildly imaginative happenings come nighttime! Sandy the cat and Frankie the squirrel guide readers through several iconic NYC sights, but they each have a very different take on what they’re seeing. In the nighttime, Sandy sees amazing visions of King Kong, aliens, giant monsters, and even a rocket blasting off, but Frankie comes around to reassure her that Central Park, statues in front of the Guggenheim, a subway train, and the Empire State Building are all just incredible parts of this wonderful city! But we all know that the NYC isn’t called “The City That Never Sleeps” for nothing, so Sandy’s reports are intriguing, as well! This book is a visual delight that will have kids turning the translucent pages back and forth to compare images. For children already familiar with NYC, there will likely be joyful sounds of recognition, and for readers who’ve never had the chance to see NYC in person, this book provides a lively introduction.